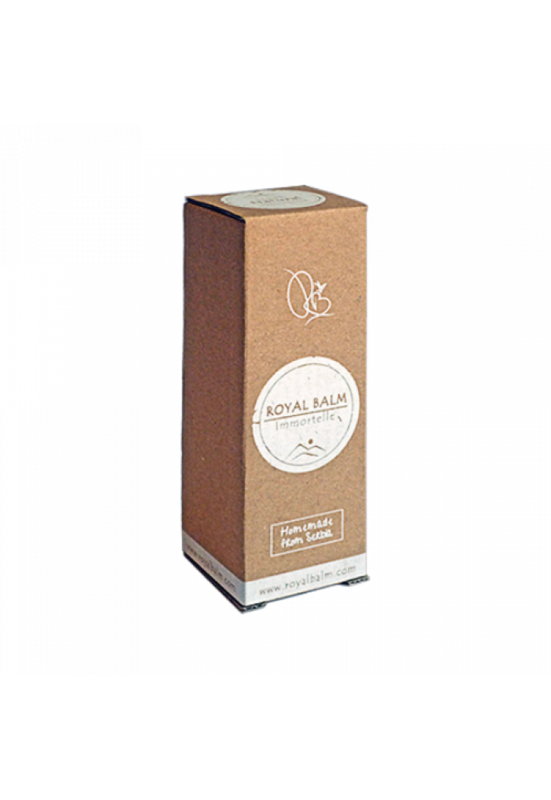 Effects Royal Balm natural anti-wrinkle cream contains flavonoids, vitamins, antioxidants, and beeswax which effectively combat the signs of aging. It deeply nourishes and regenerates the skin, restores its energy, youthful glow and elasticity while strengthening its natural protection from external influences. 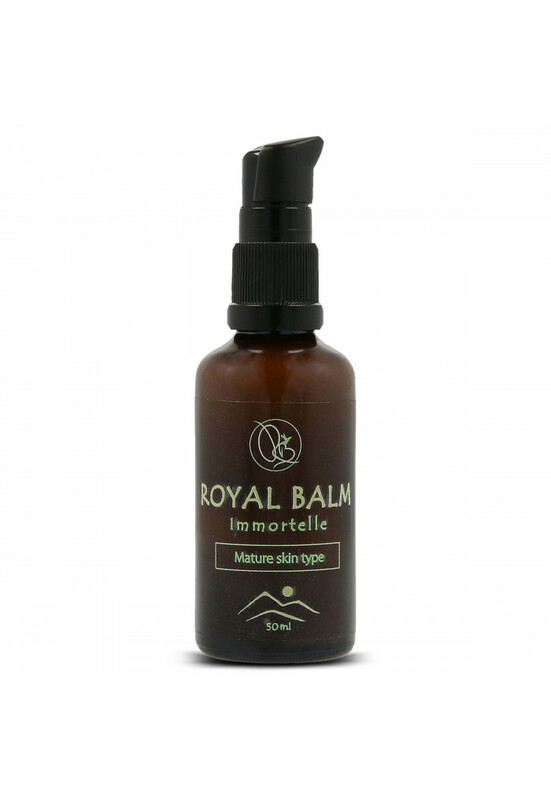 Immortelle has beneficial effects on tired skin by refreshing it and improving blood circulation. Comfrey contains allantoin which stimulates the regeneration of skin cells, while tannins protect it from bacteria and toxins. The magnolia extract strengthens the skin, reduces the signs of aging and provides it with youthful elasticity. The best anti-aging effect is achieved when it is mixed with marigold oil which speeds up the regeneration of skin cells. Sea buckthorn oil has bactericidal and anti-inflammatory properties. It is a very rich source of vitamin E which prevents the oxidation of sebum that causes the formation of blackheads. 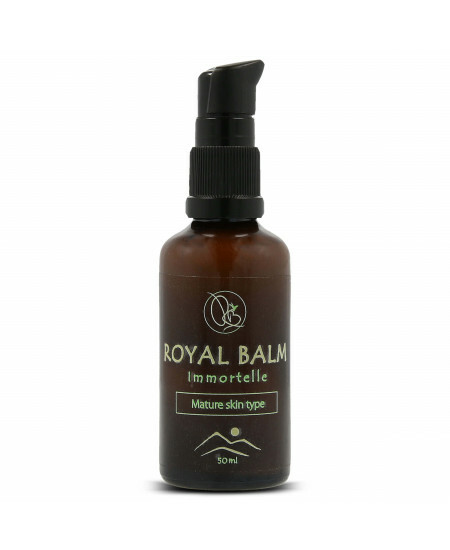 Royal Balm - Natural cream for mature skin reduces wrinkles and gives the skin the necessary elasticity and moisture. This skin type is primarily affected by the aging process that changes the very structure of the skin, and hence its characteristics. Mature skin faces reduction in collagen production which is responsible for the skin elasticity, so one of the characteristics of this skin type is increasing number of wrinkles. In addition to the loss of elasticity and the appearance of wrinkles, the skin also loses necessary moisture, it becomes dry and can also change pigmentation. 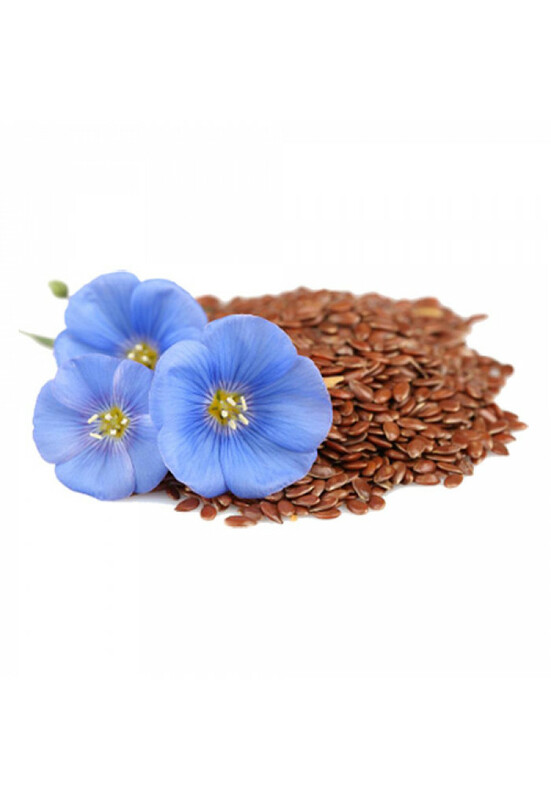 Natural cream for mature skin contains linseed oil* that is unmistakable when it comes to hydration and nutrition of mature skin. It contains omega-3 fatty acids, potassium, vitamin E, magnesium. Thanks to its phytoestrogens, which activate the regeneration process, the skin becomes smooth and elastic. 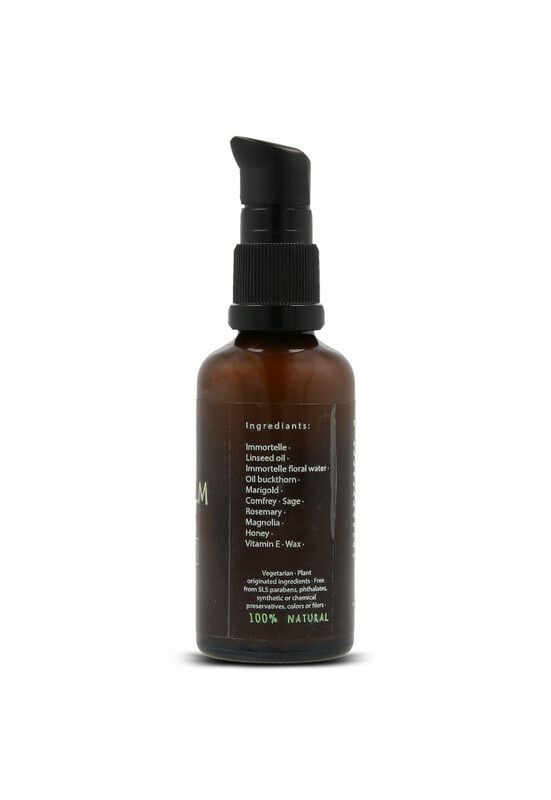 Immortelle floral water* promotes skin cell regeneration and increases blood flow to the capillaries underneath the skin. It hydrates, refreshes and soothes the skin. It also helps with tired looking skin. The sea buckthorn oil*, as one of the richest sources of vitamin E, deeply nourishes and revitalizes the skin. Comfrey* contains allantoin that stimulates the regeneration of skin cells, and tannins protect the skin. Use morning and evening, on face and neck, avoiding the eye area.